At Fish River Roasters we do a lot of regular coffee machine maintenance in order to keep our customers machines up, running and making great coffee. In between this work we often have a few restoration projects of older, rare and collectible espresso machines. We have had two restoration projects completed. 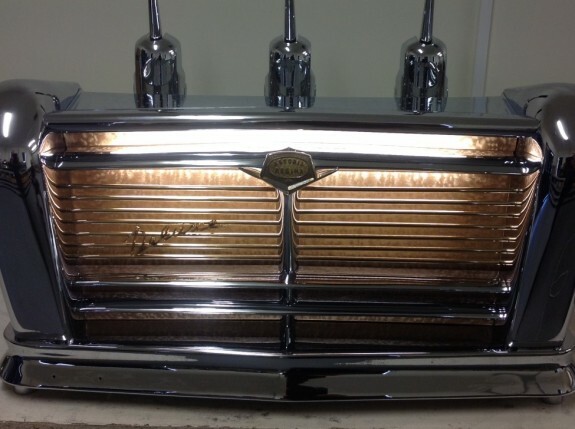 The first was a 1957 Astoria Regina three group level machine. This machine would have been one of the earliest espresso machines into Australia. That’s assuming it came here not long after it was produced. We got it after it had been sitting in a shed for a while up on the North Coast of NSW. It needed plenty of work outside and in. We had to completely strip it down to it’s component parts, then repaint the frame and have the external components re-chromed. On this inside we tried to keep as much of the old components as possible. We had to remove the end plate from the boiler, remove some of the old studs and remake and tap the fittings. A new element was installed, as well as a new pressure stat. The “auto fill system” was essentially a float system like in a water trough and it had to be re-machined to get it working well. The electrical wiring was pretty much gone and needed to be replaced as well which allowed us to get the original light box in the front working. The pistons and seals in the group heads were corroded. However we found a supplier who still had some in Italy so luckily were able to get original parts for the group heads themselves. It now looks amazing and makes excellent coffee. Our second restoration project was a single group Visacrem lever machine, more on that later!